Are cell phones and iPods safe for skiers? “Hey, how you doing?” says my chairlift neighbor. I answer enthusiastically, “Great. The skiing is excellent!” No reply. Then I realize he’s talking to someone else on his cell phone. His conversation clips on for the entire 8-minute ride, only I’m not party to it. That same weekend, there’s a kid skiing slowly ahead of me. When I politely say “on your left” as I overtake him – he does not react. As I carefully squeak past him, I spot the tell tale ear plugs. He’s tuning out to his latest download, impervious to the sounds around him. While this enrages my etiquette feathers, it speaks to the times. When I was a kid, good tunes on the slopes made reference to how sharp your edges were. Now it’s all about iPods, MP3s, walkie talkies and cell phone ring tones. It’s not just a nuisance; it’s an industry trend as everyone’s jackets are equipped with electronic pockets, ear bud plugs, and volume controls. Helmets come with speakers, even subwoofers – geez. This ski technology is groovy but I think we need to crank up the common sense. Parents in particular need to be better role models on the slopes, and teach their kids about sound safety when it comes to skiing and riding, an inkling of etiquette would be a bonus. On the issue of courtesy and camaraderie, skiing is supposed to be social. Why not converse with those next to you (who share a favorite snow sport). Besides, it’s just rude to yammer on your cell when seated so close to 3 other skiers for a 5-10 minute ride. If you aren’t in the mood to chat with your chair neighbor (or you want to listen to your own tunes on the chair), that’s fine – but don’t force everyone else stuck on the same lift to listen to your noise. If you have to take a call, politely pardon yourself, and keep it brief. In a confined gondola car, step outside with your phone- okay that was a joke . Of course, safety is the big issue. Skiing with music is okay, I like a good beat for the bumps myself (though I prefer the song in my head version). You have to keep the decibel level low enough that you can still hear skier traffic. You have to be aware of what’s going on around you at all times. Don’t compromise your 5th sense to the point of collision. Not cool. 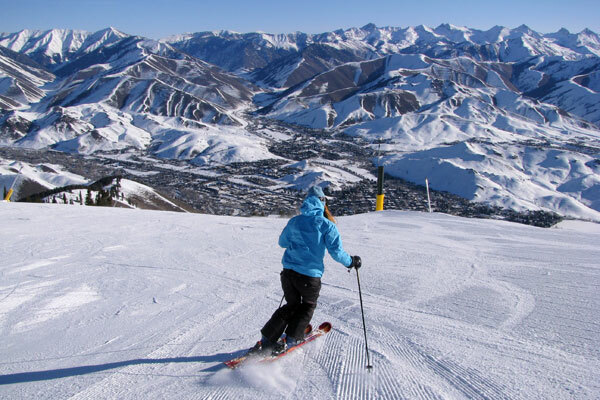 Skiing and snowboarding are technical sports that require your attention. Recent road studies indicate that calling and texting while driving is as dangerous as drunk driving. I’m sure the same can be said about flying down a snow-covered hill while distracted in electronic dialogue. Skiing while simultaneously texting or talking on a cell phone is an accident waiting for an intersection. Have you seen the guy with his flip phone tucked into his helmet, sliding down the hill half heartedly, chatting away as his edges chatter? He thinks he’s so cool; he has people to talk to. I think he’s an idiot. If you get a call, let it go to voice mail (available on all phones – really!). If you absolutely must make a call or radio your family, pull over to the side of the trail, out of the way but in sight of other skiers, to carry out your quick communication. Talk to your kids, when their ear buds are out, about safe sound skiing. Our younger generation hasn’t a clue about what’s appropriate when it comes to audio etiquette. Remind your pubescent phone fan that cells should be used for necessary communication – like meeting Mom – that’s it. A little music is all right, as long as other skiers, or the approaching groomer or snowmobile, are audible. Point out the benefits of skiing au natural, the squeaky snow under foot on a cold January morning versus the slushy sounds of spring corn. You hear the swish of branches as you glide through snowy glades, and the occasional “woohoo” from a wicked happy skier. Or if all else fails, scare the iPod off your offspring with scary stories of skiers who couldn’t hear the Bombardier barreling down on them until their song was over. Mind you, I grew up skiing at Smugglers’ Notch in Vermont, back in the day of the Sony Walkman – a bulky bright yellow device that skipped several beats on serious steeps or bump runs. Now I enjoy precious peace and quiet on her ski runs – unplugged from the din of downloads and ring tones. Read more on Distracted Skiing with Technology.